Accommodation on board The Eastern & Oriental Express. Travelling in private compartments, passengers on board the Eastern & Oriental Express are attended by Cabin Stewards throughout the journey, and are assured of attentive yet discreet service. All compartments are elegantly appointed with inlaid woods, antique brass and the modern comforts of air conditioning and an en suite shower and WC. Sockets are suitable for international plugs (220 volts) and each compartment has a personal safe. Hairdryers are available in each compartment. Each cabin is fully air-conditioned with an en suite shower, washbasin and WC and features large picture windows for an excellent view of the passing scenery. Facilities include 24-hour steward service, international electric sockets (220 volts) and 110 volt adapter for razors, a personal safe and hairdryer. Passengers may select from three types of compartment: Pullman, State and Presidential. Cabins convert in moments from daytime seating to a comfortable bedroom. The Eastern & Oriental Express has 30 Superior Cabins that measure comfortably at 62 square feet. During the daytime the compartment is a private lounge provided by a banquette style sofa. At night the seating converts to an upper and lower bed. A private en suite shower, washbasin and WC is also provided in your cabin. Superior Cabins are also available for single configurations. The Eastern & Oriental Express has 28 State Cabins which measure 84 square feet each. Configured as a private lounge during the day, with a banquette style sofa, fixed chair and one movable chair. Fixed daytime seating converts to two single beds at night. A private en suite shower, washbasin and WC is also provided. 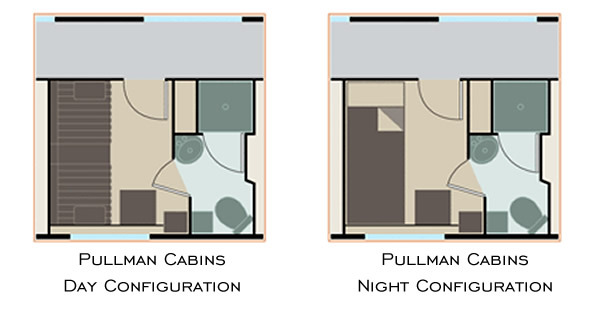 Each Presidential Cabin measures at 125 square feet, the ultimate in luxury train comfort. The cabins are configured as a private lounge during the day, with banquette style sofa and fixed chair, and two movable chairs. Fixed daytime seating converts to two single beds at night. A private en suite shower, washbasin and WC is also provided. Guests in Presidential Suites enjoy the additional benefit of a complimentary bar in their cabin.